The SOLFRUNT 1931 process gauge is available in 4 ½” or 6” gauge sizes, with an aluminum back-flanged case for applications needing stem or wall mounting. The aluminum case has excellent safety and chemical resistance for harsh environments. These models are available with 316L SST, including a seamless bourdon tube in pressure ranges from Vacuum to 6000 psi. 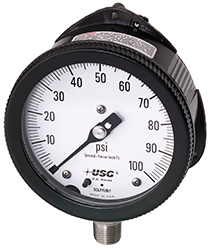 The 4 ½” pressure gauge is available as a dry or liquid filled gauge with glycerin, silicone, mineral oil or fluorolube.